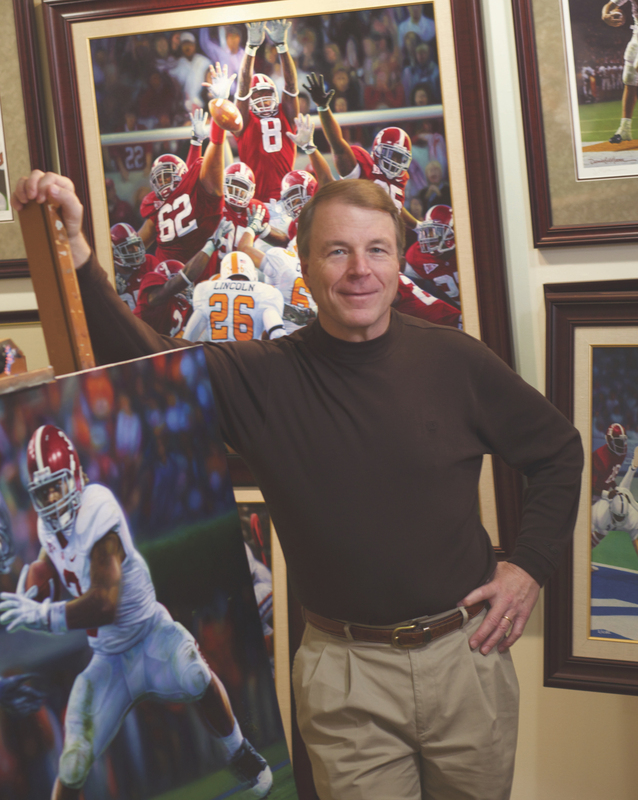 Daniel Moore exhibition opens Sept. 11 at Evelyn Burrow Museum; reception with Moore at 6 p.m.
HANCEVILLE – The Evelyn Burrow Museum is proud to announce an upcoming exhibition featuring the artwork of renowned sports artist Daniel A. Moore, just in time for football season. A collection of original paintings and bronze sculpture by the artist will be on display from Sept. 11 through Nov. 2 in the museum, located on the campus of Wallace State Community College. Moore scored big when he released his first limited edition art print titled “The Goal Line Stand” in 1979. The painting commemorates Alabama’s great defensive stand against Penn State in the Sugar Bowl, winning the 1978 National Championship. Quickly becoming collectors’ items, the prints have appreciated by well over 5,000 percent in value, currently selling for up to $2,500 each on the secondary market. Moore has earned commissions from the SEC, MLB, NFL, NBA, USGA, PGA, the Sugar Bowl, Outback Bowl, Citrus Bowl and Liberty Bowl, as well as numerous universities. The United States Postal Service sought his talents for the 1997 “Legendary Football Coaches” commemorative stamp series featuring Vince Lombardi, Paul “Bear” Bryant, George Halas and “Pop” Warner. Moore’s art has been the subject of two books: “Crimson & White and Other Colors” (1999), a collaboration with publisher David Moore, his brother, and “Iron Bowl Gold” (2005), which features 41 watercolor paintings that document the “golden years” of the great Alabama-Auburn gridiron rivalry when the annual game was played at Birmingham’s Legion Field. The book was a collaborative effort by the artist, the late legendary announcer Keith Jackson and The Birmingham News. In 2005, Moore was named the “Sports Artist of the Year” by the United States Sports Academy. In his early years, Moore received art training and encouragement from his mother, Cary Moore, an artist and art education major at the University of Kentucky. She kept her budding artist supplied with finger paints, watercolors and later with oil paints. Moore’s father, August (from whom the artist takes his middle name), kept the aspiring young athlete supplied with football helmets and baseball gloves. Moore studied art at Berry High School in Birmingham, where he also played varsity football. He went on to receive his Bachelor of Fine Arts degree from the University of Alabama where he focused on super realistic painting, sculpture and printmaking. “I consider it a tremendous blessing to enjoy a successful career, one established on the logical confluence of two major passions in my life — art and sports,” he said. An opening reception will be held on Tuesday, Sept. 11, from 6 to 8 p.m. at The Evelyn Burrow Museum, with Moore in attendance for a meet and greet, and signing. He will have prints for sale and will sign those and any other prints of his work individuals would like to bring to the opening. The public is invited to attend. For more information, call 256-352-8457, email burrowmuseum@wallacestate.edu or visit www.burrowmuseum.org. The Evelyn Burrow Museum is regularly open Tuesday-Friday, 9 a.m. to 5 p.m. and Saturday, 10 a.m. to 2 p.m. Admission is free.